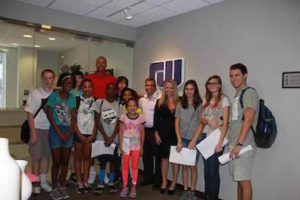 The Lawrence Funderburke Youth Organization Financial Life Skills camp had an exclusive look at commercial real estate through the lens of The Robert Weiler Company and our president, Skip Weiler. Throughout the day, the campers were introduced to the world of commercial real estate negotiation, sales, and appraisal. In the morning, the campers had the opportunity to tour HighPoint at Columbus Commons while learning what it takes to secure an apartment lease. We also showed them the many surrounding retail locations for rent in Columbus. And, after lunch, participants worked with Skip on a real-world commercial real estate transaction through a role-play scenario. The kids played various roles within a typical transaction, such as buyer, seller, listing agent, appraiser, surveyor, and lender while learning about the art of negotiation. The Robert Weiler Company had a great time working with the Lawrence Funderburke Youth Organization Financial Life Skills camp and looks forward to another visit (and maybe some future real estate moguls)!